Threats to data abound in today’s electronic world, ransomware high among them. Whatever the cause of the damage was, the modification to the data was undesirable and needs to be undone. Continuous Data Protection (CDP) delivers one-second granularity on rollbacks and provides the best Recovery Point Objective (RPO) and Recovery Time Objective (RTO) of any data protection solution. 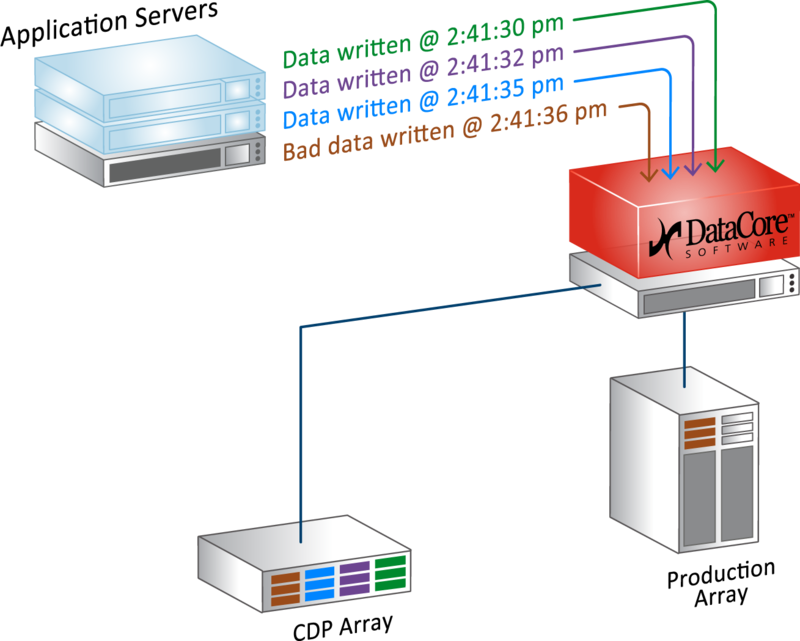 CDP records every write I/O (or change), with a corresponding timestamp, that occurs against a protected volume. With CDP, a rollback volume can be created representing any point-in-time just before the undesired event occurred. The rollback volume is then mapped to the original application server or a different one. For example, consider a virus causing damage to a volume at 2:41:36 PM; a rollback volume is created for any point in time prior and served back to the original application server. Also, consider a user deleting a file at 3:15 PM; a rollback volume is created for 3:00 PM and mapped to a different file server for retrieval, all with no interruption to the production volume. Similar to snapshot requests, one can generate periodic CDP Rollback Volumes at known-good restore points by scripting a call to a PowerShell cmdlet each time an application has been quiesced and the caches have been flushed to storage. As data is written to the protected production volume, a copy of each write I/O is copied to the designated CDP buffer pool. A rollback volume can be created based on the data that resides in the CDP buffer pool at a specified time. Talk with a storage expert to learn how DataCore can help you protect your mission-critical data from disasters.